The WTI crude oil price saw its second straight session of gains today (Tuesday) after a number of U.S. producers announced production cuts across Oklahoma and Texas. At 8:45 a.m., the West Texas Intermediate (WTI) crude oil price was up 1.7% and trading at $34.31 a barrel. Despite two consecutive weekly gains last month, the U.S. benchmark still fell 4.3% in February. It's now down 12.3% in 2016. The Brent crude oil price was also moving higher this morning. The global benchmark – priced in London – added 1.1% to trade at $36.96 a barrel. Futures for May delivery fell 0.7% last month and are down 6.2% on the year. And Money Morning Global Energy Strategist Dr. Kent Moors says today's gains mark the beginning of a sustained long-term rise in oil prices. That's why he's outlined three different categories of oil stocks that will offer nice returns as the oil price decline comes to an end. Today's boost in the WTI crude oil price comes as several oil and gas producers announce plans to curb their production quotas in 2016. According to The Wall Street Journal, some of the biggest U.S. producers said they will pull about 10% less oil from the ground this year than they did last year. These Midwest-based companies include Continental Resources Inc. (NYSE: CLR), Devon Energy Corp. (NYSE: DVN), and Marathon Oil Corp. (NYSE: MRO). But the most significant firm joining the supply cuts is EOG Resources Inc. (NYSE: EOG), which analysts consider to be the most efficient driller in the United States. After reporting its first annual loss since spinning off of Enron over 10 years ago, EOG said last week it would only pump wells that provide at least a 30% return of oil supply. This is in addition to the spending cuts outlined in its Q4 earnings report, which will cut the company's annual production by about 5%. This drop-off in oil wells will contribute to the dwindling number of operation rigs in the United States. Since the first week of 2015, the Baker Hughes Inc. (NYSE: BHI) rig count has fallen from 1,421 to 400. That's its lowest total in more than six years. According to Moors, you'll want to target companies using oil that's already been drilled. These are the oil stocks that will generate nice profits in the long term. "Unlike earlier cycles, your returns won't be coming from a rise in aggregate oil production," Moors said on Feb. 29. "Rather, you're going to profit (at least initially) from the usage of supply already out of the ground. All of which points toward companies I am tracking for early indications of a bounce." Midstream Master Limited Partnerships (MLPs): companies that make at least 90% of their revenue from transporting or storing crude oil. Midstream MLPs don't own the oil they deal with, meaning they keep making money as long as they have something to transport. Enbridge Energy Partners LP (NYSE: EEP) is one of the most profitable midstream MLPs on the market. It's up 5.8% in the last two weeks and boasts an impressive 14.1% yield. U.S. Refinery Networks: companies with strong downstream sectors (i.e. refining and distribution operations) that are spread out across the United States. You'll want to target non-Big Oil refineries that are heavily involved in both domestic distribution and export markets. One example is Valero Energy Corp. (NYSE: VLO), one of the largest oil refining and marketing companies in the United States that also operates in Canada, the Caribbean, the United Kingdom, and Ireland. VLO stock is up 4.4% since Feb. 16. Regional Operators: companies that can efficiently distribute oil to local markets. These are smaller companies that concentrate their operations in one region. A notable example of this kind of operator is Northern Oil & Gas Inc. (NYSEMKT: NOG), whose principal business is in North Dakota and Montana. Shares have gained 2.9% over the last month. The Bottom Line: With the WTI crude oil price continuing its winning streak today, the oil market is finally starting to stabilize. 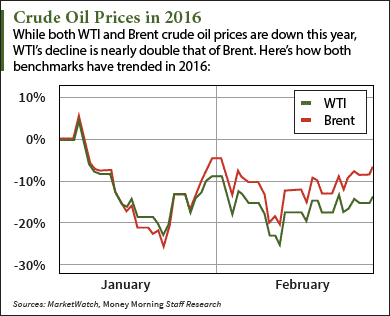 As several U.S. producers scale back production and the number of U.S. oil rigs continues to decline, oil prices will keep moving higher in 2016. In order to maximize your returns during this long-term rebound, we recommend investing in midstream MLPs, large U.S. refinery companies, and regional producers. These oil stocks will benefit the most from the price rebound.